The 177-room Park Hyatt Tokyo opened in 1994, just a few years after Tokyo’s asset bubble crash—but clearly there was still plenty of yen to spend on this iconic and globally respected hotel. With interiors designed by John Morford, Park Hyatt Tokyo is a study in modern, understated elegance and luxury. The spacious rooms (which start at 45sqm) have a substantial feel to them, with hues of green marble and granite and simple white beds of crisp white linens (you’ll find no satin pillows or sashes at the foot of beds at the Park Hyatt). And then there’s the view! 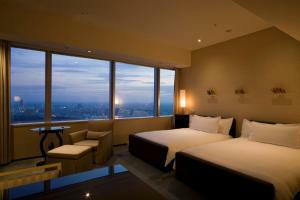 All rooms are located above the 41st floor and offer commanding views of either the city or Mt Fuji (we prefer the city views). The hotel is 20 years-old now, and while the rooms have been constantly refreshed, some do look a little bit tired, and the styling is not exactly modern anymore. The biggest complaint people have about Park Hyatt Tokyo is its location. It’s a good 15min walk from the south exit of Shinjuku Station, so it's best to cab it from the station (especially when lugging suitcases) or take a direct Airport Limo bus from either Haneda or Narita airports. Most visitors to the hotel, however, don’t even get to see inside the rooms. They come for the New York Bar, of "Lost in Translation" fame. It looked amazing in the film, and it looks (and feels) even better in person. Dinner at the adjoining New York Grill can be a bit pricey, so we suggest taking advantage of the daily lunch buffet or weekend brunch, which even at 5,000yen seems like a steal! Don’t miss the hotel’s incredible pool, fitness center and spa on the 45F, which has elliptical and running machines perched right in front of floor-to-ceiling windows. Park Hyatt Delicatessen is one of our favorite spots in Tokyo, actually. Fresh breads, amazing salads to go, and a wide selection of wines, olive oils and other food products (it's a bit like a Dean and Deluca). This is a splurge hotel, and one that is definitely worth it. Indeed, Park Hyatt Tokyo gets our full vote for Tokyo’s best hotel—though maybe it’s time for the hotel to limit smoking in the New York Bar (except for Bill Murray! ).